Jackie's Nepal Blog and Other Wanderings: One of what will be many special days. Another day is beginning and once again I’m enjoying listening to the city wake up. In some ways, I feel like I have been here forever, but at times it all seems so surreal, to be here again after just four months. Yesterday was special (but I must say, everyday so far has been special in its own way!). I spent the morning with a fellow TRIFC board member and TRIFC’s Sponsor Coordinator. We walked around Thamel for a bit and of course, we ended up doing a little bit of shopping. I have been looking for a simple dress to wear to TRIFC’s Annual Fundraiser and have been wanting to get a traditional Nepali kurta. As some of you know, I am no fashionista, and I generally do not like to shop, so this was a big deal. Fortunately, we were referred to a shop nearby that is frequented by the locals. A beautiful and sweet young woman named Dilkash, warmly welcomed us in and showed us what was available. I quickly chose the fabric I wanted for my kurta, got measured, made the purchase and set up a pick-up date. Yes, a pick-up date as it needs to be sewn. We’re talking local goods here, folks! Dilkash was efficient but made the whole process easy and fun (and for me, not the shopper, fun is always good!). I was immensely happy to learn that she and her sisters run the shop. They opened it when she was 13 and her older sister was 16! Unbelievable! But not here in Nepal! The entrepreneurial spirit is amazing! Dilkash is now in her 20’s and is primarily responsible for managing the shop. This makes total sense as she is in her second year of a Bachelors program in Management. Her typical day starts with classes in the morning until 10am, after which she opens the shop and studies between customers. I am so happy that we found this shop and that was just the beginning of this special day. I soon met up with a wonderful young man that I met nine years ago. He was only 12 at that time and he resided at the residential care home for children with disabilities where I was volunteering. He himself is not disabled, but was taken in at the home when the kids there met him at school and learned he was not being cared for. He became my right hand man during my time there. He helped tutor the younger kids and helped me navigate the mean streets of Kathmandu (not really, but it was during the insurgency, so we needed to watch our p’s and q’s). I last saw him in November, but it was very brief so I am glad that we will have more time to spend with each other. He’s a brilliant young man and is currently completing his second year of a Bachelors degree program in English Literature and in Social Work. He wants to continue his studies for a Masters degree and remain in his home country and be a teacher. He told me that once he had dreams of going abroad and leaving Nepal entirely, but now he wants to stay and help his country move forward. He would welcome going abroad should an opportunity arise, but is committed to returning home. He keeps up with world events by subscribing to the New York Times home delivery. He quickly tells me, as if reading my mind (how the heck can he afford that?! ), that it only costs the equivalent of $30 USD a year (yes, a YEAR!). But, yes, he can read my mind - he did it then and he’s doing it now! I met up again later with my team and we headed out to attend a board meeting for ADSoN (Ability Development Society of Nepal), a new organization in Nepal that will serve as boots on the ground for the projects that we do that serves persons with disabilities. They hope to grow into an organization that works also with other groups to improve the lives of disabled Nepalis both in the city and in rural areas. You might think that a board meeting would not make a day especially special, but this one was. 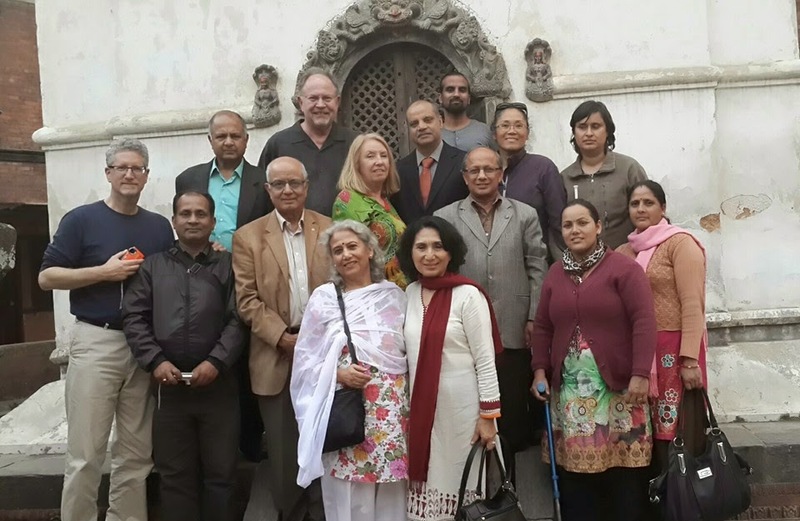 It was both awesome and frankly, a little intimidating, to be surrounded by an influential and talented group of people from Kathmandu who care so much about the plight of the disabled. We returned back to Thamel and I was feeling the urge for some dal bhat, the local dish of Nepal. A common refrain on a trek is “Dal bhat power, 24 hour”! Ha! Then I should be eating it daily, like everyone else! Anyway, I happened upon 'Sarangi", a restaurant that benefits disenfranchised sarangi musicians. More about that at a later time. Writing about dal bhat is reminding me that I need to get some breakfast as we have another full day ahead of us! Thanks for visiting my blog! Until next time, dhab bhat power, 24 hour! Namaste. Sounds like another wonderful day in Kathmandu!